Chartering a yacht from Athens for a Saronic Gulf sailing holiday takes you from one of the world's most ancient cities on a rewarding sailing adventure for more experienced sailors. Experience the famous meltemi winds whilst lapping up Greek culture and exploring the origins of Western civilisation. The meltemi only blows in July and August, so if this will be your first Greek yacht charter or if you prefer sailing at a slower pace then a sailing holiday from Athens in May, June or September could be perfect for you. The largest marina in the Eastern Mediterranean, Alimos is a good starting point for your Greek sailing adventure. If you have time, head into Athens to visit one of the many historic sights before you set sail. Visit the Parthenon and the Acropolis museum then have dinner in this ancient city before heading back to your yacht, ready to set sail the next morning. Famous for it’s beaches, Aegina is often the first and last calling point on a Saronic yacht charter, owing to it’s close proximity to Athens. The town quay is just a stones throw away from local bars & family run restaurants, and the ruins of the Temple of Apollo and Temple of Aphaia are also nearby and worth seeing. Poros is a beautiful island, and hiring mopeds or quad bikes can be worthwhile here to explore the full extent of the island at your own pace. As you sail towards Poros Town, you will notice that the island is only separated from Peloponnese peninsula (mainland Greece) by a narrow channel. One of the most vibrant destinations on our route, Poros has lively bars and restaurants in the summer season, and you’re also never too far away from quiet and stunning beaches, especially if you hire a quad or moped! Dhokos is a stunning uninhabited island, great for a sunset hike, and a perfect night under the stars. Alternatively you could simply stop here for lunch and a swim and continue to sail further towards the island of Spetses if you’re after a busy & vibrant island destination. Hydra is an idyllic Mediterranean town; a paradise of restaurants, bars & magnificent views. Famous for having no cars, just donkeys for transportation and for being the island hideout of several famous faces, including the Rolling Stones. Lots of fantastic swimming & snorkelling opportunities. A perfect little anchorage with the option of swimming or rowing ashore for a fresh seafood dinner at a great little family-run restaurant on the beach, or simply dine onboard and take in the sunset of your last night at sea. Enjoy a final day onboard, heading for a swim or snorkel near Perdika, then return to Athens around 5pm. Take the opportunity again to head into the magnificent city of Athens as it is far more interesting than the marina! 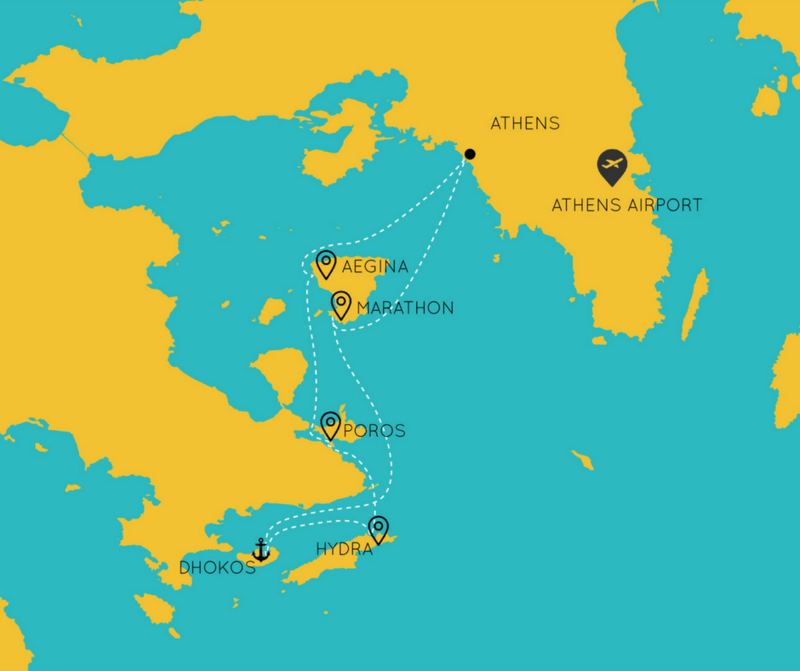 Check-out is at 9am Saturday morning – depart Greece or begin your next adventure.